My school’s Coverdell World Wise match is finally progressing. After a couple set backs, we have been able to establish a regular Pen Pal exchange between the most active of my 5th, 6th & 7th formers with a 5th grade classroom in North Hollywood, California, USA. I am so excited about this program because it gives my students an opportunity to use their English language skills outside the classroom. Not only is this an excellent communicative activity for them, but they can also interact with students their same age on the other side of the world! 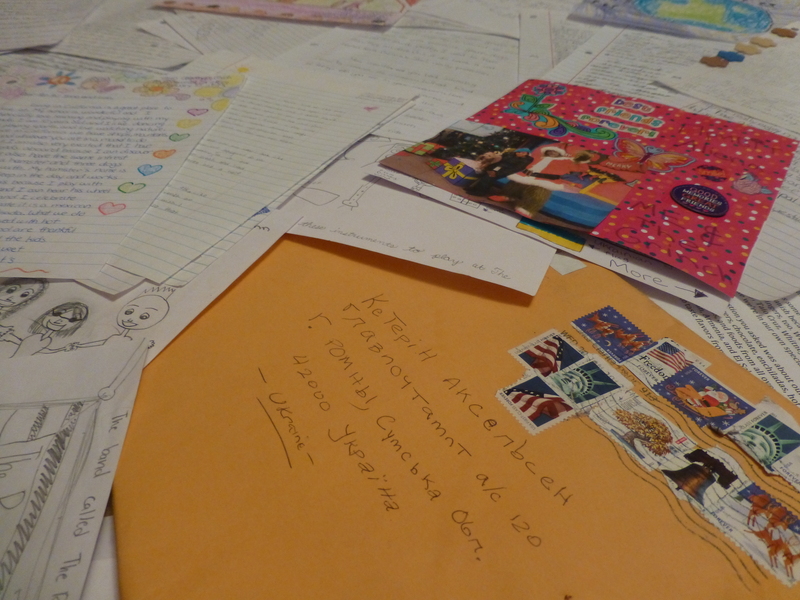 So far, we have received two batches of ~25 personally addressed letters, pictures & drawings from our partner classroom in California. Our school has sent them a video introduction of our school/English club as well as a batch of reply letters. It is so exciting to see the expression on the students’ faces when they receive their letters. At this early stage of the exchange, most of their conversations are basic and only discuss simply likes & dislikes. However, I hope that these kids will be able to continue this exchange far after I leave Ukraine and maybe one day, be able to meet each other in person! Great! can I share it with Country Director? It is very interesting that you guys are sending real letters (rather than email / Facebook messages). I thought that this young generation would be totally ignorant about this old methods of communication. Good job! I am a middle school teacher in Bonita Springs, Florida and I was recently sharing your website with my students and explaining “pen pals”, they were excited and would really like to correspond also, but have limited time in-class to do so. Would it be appropriate to have my students ask a few questions of students in Eastern Europe in a “group email” with a pen classroom in the Ukraine? It would just be for our last quarter and we would send questions and pictures electronically… We are currently covering E Europe and Russia and I am an RPCV as well (2001-03).